1. Preheat the oven to 150˚C, gas mark 2. Peel the clementines and slice in half horizontally; set aside. Use a small knife to slice the pith away from the peel. Roughly chop 30g pith-free peel (discard the rest); put in a large pan with the milk and 100g sugar. Bring to a simmer then remove from the heat, cover and set aside for 20 minutes. 2. Meanwhile, put the remaining 250g sugar in a wide, heavy-based saucepan with 100ml water. Heat gently, stirring, until dissolved. Once dissolved, do not stir – just swirl the pan occasionally to distribute the heat. Simmer until a deep, amber caramel forms. Carefully pour about 2 /3 of the caramel into a 1.8-litre ovenproof dish, covering the base, then set aside. Add 3 tbsp water to the caramel pan and return to a gentle heat, stirring to mix. When smooth and bubbling, add the clementine halves, cut sides down. Remove from the heat, set aside to cool, then cover and chill until needed. 3. Lightly oil the sides of the baking dish (the caramel will have set hard by now) and set in a deep roasting tin. Whisk the eggs, yolks and vanilla extract into the lukewarm milk, then strain through a sieve into a jug; pour into the caramel dish. Cover loosely with foil and put on the middle shelf of the oven. Carefully fill the roasting tin with enough cold water to reach halfway up the sides of the caramel dish, then bake for 1 hour 20 minutes, until the custard is set at the edges with some wobble in the centre. Put on a rack to cool, then chill for at least 4 hours or overnight. 4. To turn the crème caramel out, run a small knife around the edge of the custard. Place a large, lipped, upturned plate over the top. 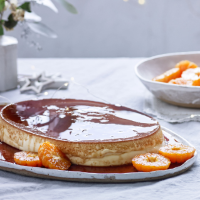 Carefully flip over and serve with the caramelised clementines alongside. This recipe was first published in Thu Nov 29 12:16:42 GMT 2018.